My first gaming monitor was made by ViewSonic, at the time it had the lowest response time of any monitor and a respectable 75Hz refresh rate, so I’ve always been a fan. But let’s be clear, the VX2573 is not designed as a game specific monitor. Of course, as always, that doesn’t mean you should rule it out but be aware that it does not come with adaptive sync technology for example. On the plus side, the VX2573 does have a lot going for it, it features a stunning design, it’s a 25″ inch monitor (a rare form factor) and offers a top quality display. 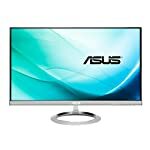 The shw is the white version of this monitor, if white is not to your taste then there is also a gold VX2573-sg model, although personally I’m not convinced that this is an improvement. This style of monitor undoubtedly looks smart, almost “Apple” like, but many gamers will be looking for something that is a straight forward plane black frame, something more simple. Let’s get to the point, this is one beautiful looking monitor. This is the kind of monitor that you might want to buy just so it can be displayed proudly upon your desk. But it’s not all about looks, the screen is super thin at just 15mm, which keeps it light and is practical where space is tight. This light weight look is matched with an ultra thin bezel giving you the zero border effect and enhancing your experience of the monitor. The border is just 0.8mm thick which is about as narrow as you can hope for, ideal if you want to place two of these side by side. This ViewSonic is definitely designed to look like a premium product and will look right in place in a modern office or home. Tilting the monitor back of forth is simple and despite what looks like a small base the screen is stable which is always important if you intend on bashing your keyboard during a heated game of Starwars Battlefront. Unfortunately there is no height adjustment which is frustrating given the otherwise premium design – you won’t want to place something this good looking on a pile of books! The ViewSonic VX2573 is focused on giving a great quality image most suited for the casual gamer. A 5ms response time on an IPS panel is decent enough, you need to go to a TN based screen to get the best refresh rates. But the advantage of an IPS monitor is clearer more faithful colour reproduction and better viewing angles. With the VX2573 you still get a great picture even when looking side on. This is a 1080p full hd monitor, so you won’t need a top line graphics card to get 60 frames per second in current games. A modern entry level card such as the Nvidia GTX960 is more than capable of 1080p gaming at high settings at this resolution. With a 5ms response time you will get minimal ghosting and blurring but remember this screen does not come with FreeSync/G-Sync and it has a maximum refresh rate of 60Hz. 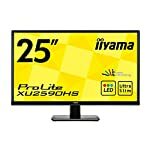 This is a good monitor if you want a high quality image on a 25″ screen at a decent price, but if you are looking for the latest gaming features you’ll need to look elsewhere. And of course, you’ll have to pay more too! We give the ViewSonic VX2573-shw a 4.5 out of 5 rating. Want to know what existing owners of the monitor think? You can read real user reviews here. 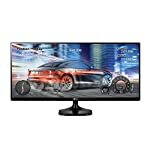 Should I buy the ViewSonic VX2573-shw? Welcome to the ViewSonic VX2573-shw FAQ. This section attempts to answer common questions you may have, please get in touch if you have any more queries or if you think our answers need updating. Can I use this with an X Box 360? I don’t see why not. We’re PC gamers here but this monitor comes with two HDMI ports and a VGA socket.